OK, here's the problem with Hollywood today. (Or to be more specific, one of the man problems with Hollywood today.) People are known more for who they are than for what they have done. I used to actually watch shows like Entertainment Tonight, before they became nothing buy gossip. If we are talking about actors and directors, let's talk about what their latest work is or what their upcoming projects are, and not who they are dating or how they got arrested. Is there a time and a place for those things? Maybe, but I'm far more interested in learning more about the artist and their work and not where they went on vacation. That's why we can be shocked when someone in the entertainment industry suddenly (or seemingly suddenly) does something different. I know Joel Edgerton as a character actor who has popped up in many, many things and who has slowly worked his way into leading roles in studio films like The Odd Life of Timothy Green, The Great Gatsby and Exodus: Gods and Kings. But, I had no idea that he had aspirations to be a filmmaker until The Gift was released, which Edgerton not only stars in, but was also written and directed by him. Simon (Jason Bateman) and Robyn (Rebecca Hall) have recently moved back to Los Angeles after spending time in Chicago. They find a house in the hills and begin to decorate. While at a home goods store, Simon runs into Gordo (Joel Edgerton), an old friend from high school, and they briefly exchange pleasantries. Afterwards, Simon confesses to Robyn that he has no recollection of the guy. Which makes it seem quite odd when Gordo shows up at their house. Not wanting to be rude, the couple has him in for dinner and he and Simon reminisce. Gordo soon starts to leave presents on the front porch of the house and he suddenly appears at the door when Simon is at work. Simon doesn't trust Gordo, and after a particularly awkward dinner, asks him to leave he and Robyn alone. But, these events have triggered a series of paranoid thoughts amongst the group where we will learn that no one is as they seem. In a rather clever move, Edgerton has constructed The Gift much like a present. On the outside, everything is nicely wrapped and looks very innocent and inviting. But, as one begins to unwrap things and peel away the layers, the truth is exposed and we learn that there are many secrets involved. In this sense, the movie plays like a mystery. At the outset, everything seems very clear and the roles are clearly defined. But, as things progress, the truth slowly comes to the surface, and there are some nice twists along the way. Given this, the movie plays much more like a character study than a thriller. If you remember seeing any ads for The Gift, it was presented as some sort of updated Fatal Attraction, but with a man stalking a man. That's not really the case here. The movie is much more of a psychological drama than anything else. Yes, it was Gordo's visit which set some of the plot into motion, but the move from Chicago to California also had its share of intrigue. Edgerton takes his time letting all of this simmer and it comes to a head in the final act. The issue with The Gift is that this balancing act appears to be too much for Edgerton at times. Perhaps its because we've seen similar films, such as Fatal Attraction, but the thriller elements seem very heightened in the first act, as we are convinced that Gordo is out to get this couple. But, the movie then settle into a groove which focuses far more on Simon and Robyn, and the film becomes much more about marriage and how spouses interact. To be honest, I became rather bored during this part of the movie, as it became something on par with a LifeTime movie. Things pick up again in the third act, which slowly builds to a conclusion which will certain trigger discussions if one is watching this with a group. But, the ending felt to me like a sudden apology for the slow parts in the middle, as if Edgerton knew that he needed to go out with a bang. There is also issues with the casting. While it's great to see Bateman branching out from his usual neurotic characters which he plays in comedies, he's not the right person for this role. We've seen him be acerbic and caustic in the past, whereas Simon should have been much nicer. 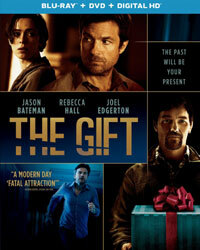 While The Gift is flawed, I admire it for taking an "adult" approach to making a psychological thriller. It seems that other thrillers made today, no matter how "grown up" the subject matter may be, still offer an amount of (no doubt studio encouraged) action and titillation so that it will cater to a broader audience. Edgerton sticks to his guns and brings us a serious, sometimes dour, look at relationships and how other people can wear masks. The movie isn’t really thrilling or creepy, but the ending will certainly give some audience members pause and may get under their skin. The Gift shouldn’t be so koi on Blu-ray Disc courtesy of Universal Studios Home Entertainment. The film has been letterboxed at 2.35:1 and the Disc contains an AVC 1080p HD transfer which runs at an average of 34 Mbps. The image is sharp and clear, showing only a hint of grain and no defects from the source materials. The colors look very good, and the image is never overly dark or bright. (Edgerton has actually chosen to use many bright daytime shots, which is quite clever.) The level of detail is good and the picture delivers a nice amount of depth. The Disc carries a DTS-HD Master Audio 5.1 track which runs at 48 kHz and an average of 2.7 Mbps. The track delivers clear dialogue and sound effects. We aren’t overwhelmed by action movie level audio effects here, but there are some nicely placed stereo and surround effects which occur during scenes where we wonder if someone is in the house. These show off distinct noises and truly place us in the middle of the action. The Gift Blu-ray Disc contains an assortment of extras. We begin with an AUDIO COMMENTARY from Writer/Director Joel Edgerton. Edgerton also walks us through the "Alternate Ending" (7 minutes), which actually answers too many questions (and you won't hear me saying that very often). The Disc contains four DELETED SCENES which run about 8 minutes and can be viewed with commentary from Edgerton. There's only one truly new scene here. "Karma for Bullies" (2 minutes) is a quick promo for the film which contains comments from Edgerton and Bateman. "The Darker Side of Jason Bateman" (1 minute) is another quick promo which focuses on Bateman's character.